I’ve realised that this is only the second time I’ve been back home since my family moved out of the Ampang Road house to Bangsar. Having spent the large part of my life growing up smack in the middle of town, I’m still finding my feet in the new neighbourhood … recalibrating where the nearest optician, mini-market, cobbler and local coffee-shops in Bangsar all are. So there we were – childhood friends of old (all a little more grown-up than we once were, one 30 kgs skinner than he once was), convened around the weathered round tables and aged plastic chairs of the local kopitiam for some good ol’ hawker food. Unfortunately, theOneInTheMiddle with the Kwan-lo Pork Noodles (dry-style, non-soup based) was still closed for Chinese New year so we settled for theOneInTheCorner with the Sarawak Laksa and Char Koay Teow. For non-Malaysian readers, I’m not purposely being cryptic here – its just the way locals describe coffee shops. I’ve begun to fathom the reason why… the large majority either have long, completely un-rememberable names (take for instance my favourite WahTanHor stall : Kedai Kopi Meng Chuan (Soo Kee’s Son)) or aren’t sign-posted at all. We ordered most of what was on offer and picked at one another’s food so we could sample a little of everything. First up, Hokkien Prawn Mee with all the trimmings… prawn, shredded chicken, kangkung, hard-boiled egg, deep-fried shallots and a helping of chilli paste on the side so you could spike the sweet, tasty pork-bone based broth to your heart’s content. No complaints other than the fact that the vendor mixed up our order of mixed egg noodles and bihun and served ours without the latter (Eng was too hungry to complain and tucked in regardless). 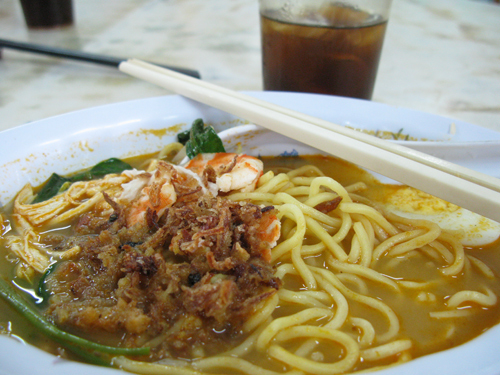 Next in line was Sarawak Laksa which I must admit I’ve never actually tried before. I’m a purist when it comes to my Laksa and usually opt for the Nonya Assam type which is Sardine and Tamarind based over the rich Coconut-milk based Curry Laksa. However, this East Malayan version which is a hybrid of both the Assam and Curry varieties is one that could grow on me. Served with rice vermicelli, sliced omelette and prawns, the chilli and coconut-milk based broth is slightly lighter and sweeter on the palate than its counterparts. 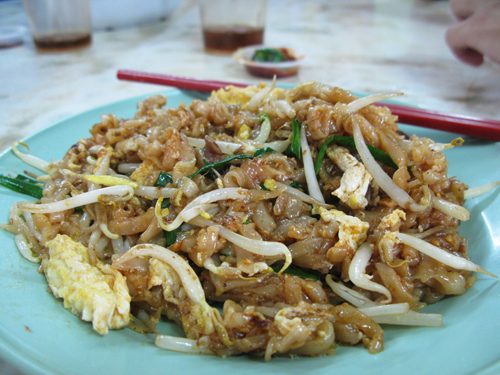 Given I wasn’t planning on making it up to Penang this trip for my usual Char Koay Teow run at Lorong Selamat, I was hoping a large portion here (fried by a chap called Steven) would help to quell my craving for the real thing. The core ingredients were all there – see-hum (cockles), shrimp, egg, bean sprouts, pork lard, chives, the works. So how did Bangsar’s Steven fare vs. the Queen of Lorong Selamat (who I must add wears Chemistry Safety goggles and a Parisian hat when at work)? I felt the noodles here were overly moist and an extra kick of Chilli was much needed. Overall, at least a few yards short of Penang’s finest. 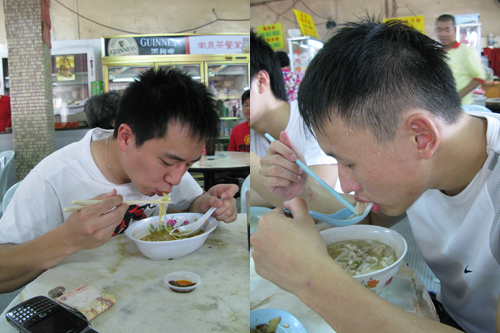 I volunteered to check that Colin’s Pork Mee and Roasted Chicken rice was safe for eating before he tucked in. The Pork Mee’s broth was full-bodied and wholesome with generous helpings of Pork Balls and Mince meat. It was certainly decent enough to warrant Colin ordering a second for the road. 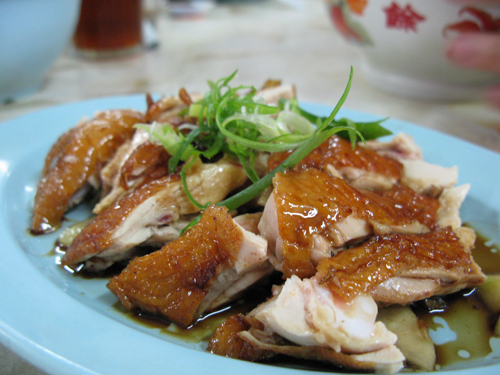 The Chicken Rice man’s Roasted Chicken was also much better than I last remember. Maybe my standards have dropped given the time I’ve spent away but the bird was certainly a lot more juicy, tender and tasty than the last time my mom took-away from here. 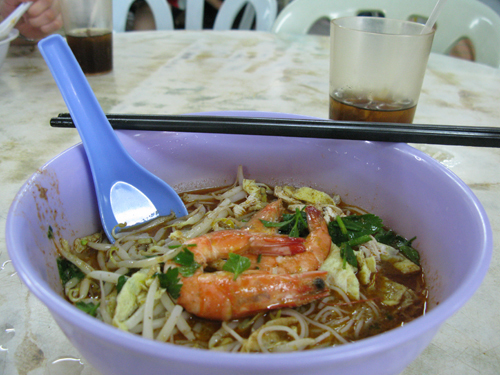 Hawker food in K.L. does seem to be getting increasingly expensive with the times though. Most dishes this time around were about 5-6 ringgit each (I could have sworn the last time I was back, none exceeded a fiver). But in the grand scheme of things, at a mere 1 quid a dish, it’s still very good to be home indeed. Time to eat up before inflation catches up with us.